Growing plants in terra cotta pots adds a beautiful touch to your outdoor container garden areas. Terra cotta is porous, so over watering plants is nearly impossible. However, because terra cotta pots are absorbent, the pots tend to crack and crumble due to frost and cold weather fluctuations in the winter. Tone down the harsh color on new terra cotta pots by brushing the pots lightly with plain yogurt. The yogurt speeds up terra cotta aging by encouraging the growth of algae on the pots. Presoak terra cotta pots. Before placing your plants in terra cotta pots, soak new pots in water for 24 hours to provide the pot with its own moisture, so it doesn't rob the plant of moisture. Provide winter protection. If possible, purchase frost-resistant terra cotta pots. If you flick the pot with your fingernail, a clay pot that resists frost damage has a duller sound than a pot that is less frost resistant, which produces a "ting" sound. Group the pots together in a sheltered area of the yard during the winter. The grouped pots insulate each other, which provides some protection from the cold temperatures. 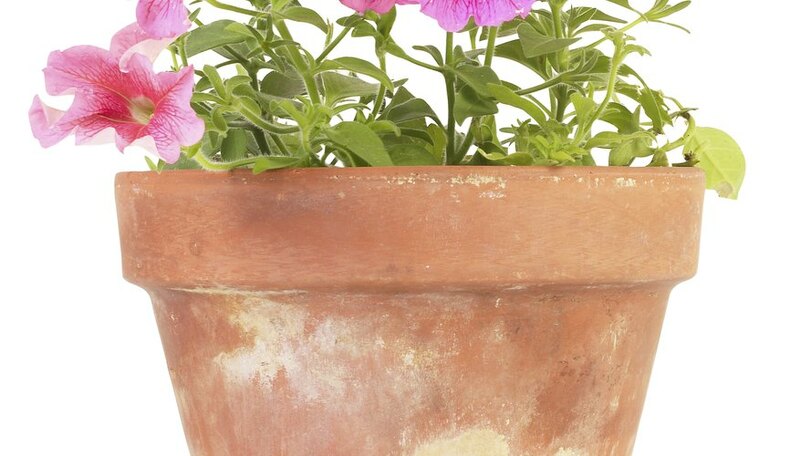 Clean the terra cotta pots each year to prevent passing along fungi, bacteria or viruses. Remove plants and soil from the pots and bake the containers in the oven set at 220 degrees Fahrenheit for an hour or so to kill anything residing on the pots. Allow them to cool slowly to room temperature before moving them. Another option for cleaning terra cotta pots is to soak them in white vinegar. Rinse well and let the clay pots sit for a couple of days to dry out before replanting.